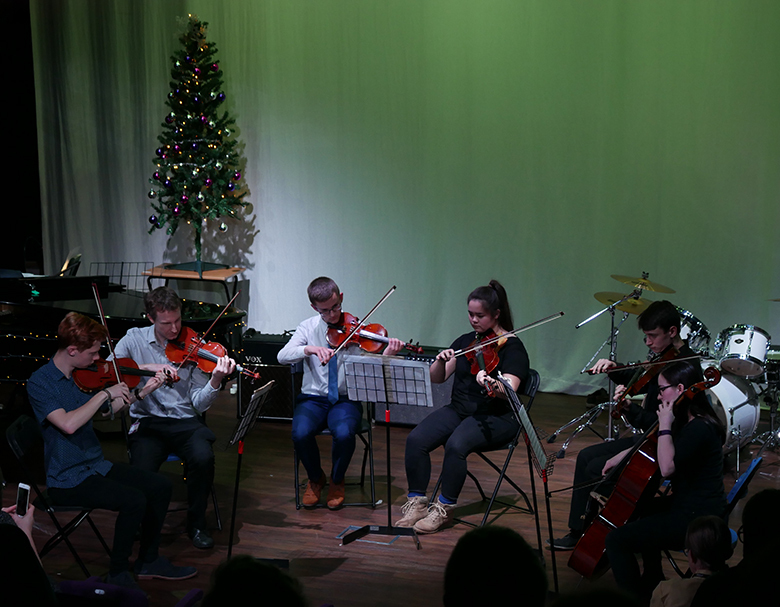 Music students at The Sixth Form College, Solihull entertained staff, students, parents and guests on Wednesday night, as the Christmas Concert got everyone into the festive spirit. Christmas songs were very much the focus, as the College Choir of staff and students performed both traditional Christmas carols and some more contemporary festive tunes such as “Winter Wonderland” and “Do you hear what I hear”. The audience joined in with three carols – “Once in Royal David’s City”, “While Shepherds Watched their Flocks” and “O Come All Ye Faithful”. String and Flute groups performed a variety of festive and classical pieces, while there were solos on the flute, violin, piano, guitar and voice too. The College Soul Band were in good voice with a Michael Jackson hit “Off the Wall”, the Jazz Band played a student composition and a group of A level Music Technology students performed “Come Together” by the Beatles. The College has students on both A level Music and Music Technology courses and more information about these courses is available on our website at www.solihullsfc.ac.uk. The next music concert will be the Easter Concert on Wednesday 5 April at 7.00pm. Tickets will be available for this concert following half-term at the end of February.